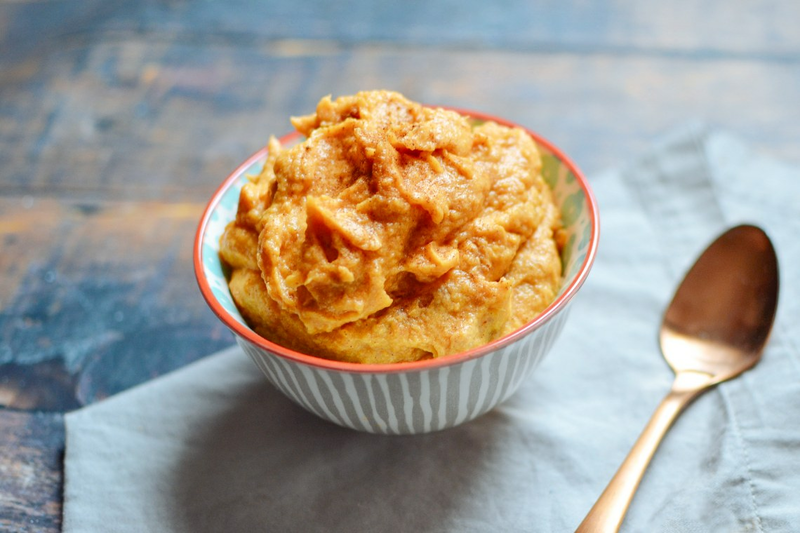 Sweet mashed potatoes are the perfect side dish to any meal. These rich and creamy potatoes seasoned with cinnamon and nutmeg are ready to eat in under 30 minutes thanks to your pressure cooker. 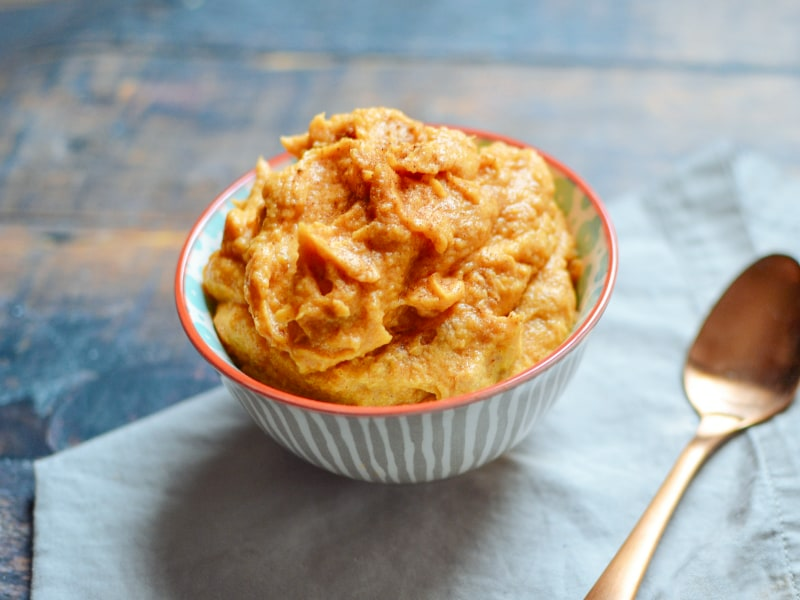 Pressure Cooker Mashed Sweet Potatoes can definitely be served as a weeknight side dish, but they are also elegant enough to be added to your holiday entertaining menu. For added flair, sprinkle a little bit of extra ground nutmeg on top before serving. You can make this side into a part of your Whole 30 diet plans by omitting the maple syrup and using ghee instead of butter. Using unsalted butter allows you to control the seasoning in this recipe. Per Serving: 237 calories; 6g fat; 43.7g carbohydrates; 3g protein; 15mg cholesterol; 137mg sodium. I love these mashed sweet potatoes! I've been eating them with everything lately. I really like the maple syrup as a natural sweetener, as opposed to using sugar. If you prefer a milder taste, you can skip the syrup all together, they will taste just as great. Also, using my pressure cooker drastically cuts the cooking time in half. It's much quicker than baking or boiling the potatoes in a pot of water. Fast and simple, just how I like it! I really liked this recipe. I was hesitant about the maple syrup at first, but it actually gave it a nice velvety texture, and good flavor. The cinnamon and nutmeg is a must! I will probably only ever use my pressure cooker to make sweet potatoes from now on because it was so fast and simple. Didn't realize I had run out of syrup. Used a mix of brown sugar and honey, which seemed to be a winner with the entire family. This was simple and easy to make. A nice change to mashed russets or whatever type you use. Not sure if this is a side dish or a dessert, but whatever it is it's delicious. I used real maple syrup and it made the sweet potatoes very sweet. I did not use any sea salt, just cinnamon and nutmeg. I made these mashed sweet potatoes as a side, and seasoned them with cinnamon and nutmeg. I did not use the maple syrup, not really a fan of the flavor. Cooking sweet potatoes in the pressure cooker is so much quicker than roasting or boiling them. Simple and smart! Not too sweet, but We didn’t care for the nutmeg so much. Our 3 year old loved it! This was super easy and delicious. The sweet potatoes were so smooth and tender after the pressure cooking that I just used a spatula to whip up the butter at the end instead of a hand mixer.